If you want to keep your business on track, you must ensure that each part of your business is running at its best. One element falling out of place could harm your bottom line in more ways than you think. Procurement is one of the most essential pieces of the puzzle if you would like your business to remain profitable. Any problem that prevents you from getting products from your supplier can impact you in many negative ways, a trap into which you don’t want to fall. You won’t be able to spot and respond to all possible setbacks no matter how hard you try. 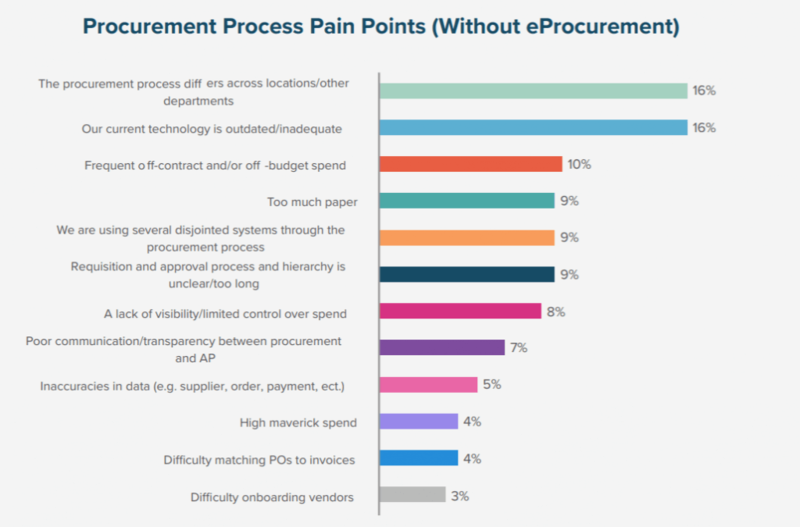 In a recent report by Levvel Research, the likes of fraud, compliance and inefficient invoice processing were listed as the biggest challenges of manual procurement processes. 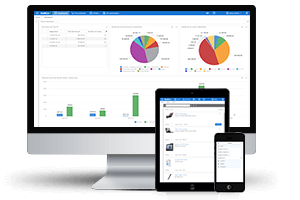 A growing amount of organizations are beginning to realize the benefits of eProcurement software. One particular technology within procurement that is having the biggest impact is Artificial Intelligence (AI). This blog explores the future of AI in procurement. Before you examine the future of AI in procurement, learn what AI is and how it works. As Gartner put it, in their Hype Circle for Emerging Technologies, 2018, “AI, (is) one of the most disruptive classes of technologies”. With AI at its disposal, the procurement function is becoming a key provider of insights and guidance in increasingly complex supply chains. 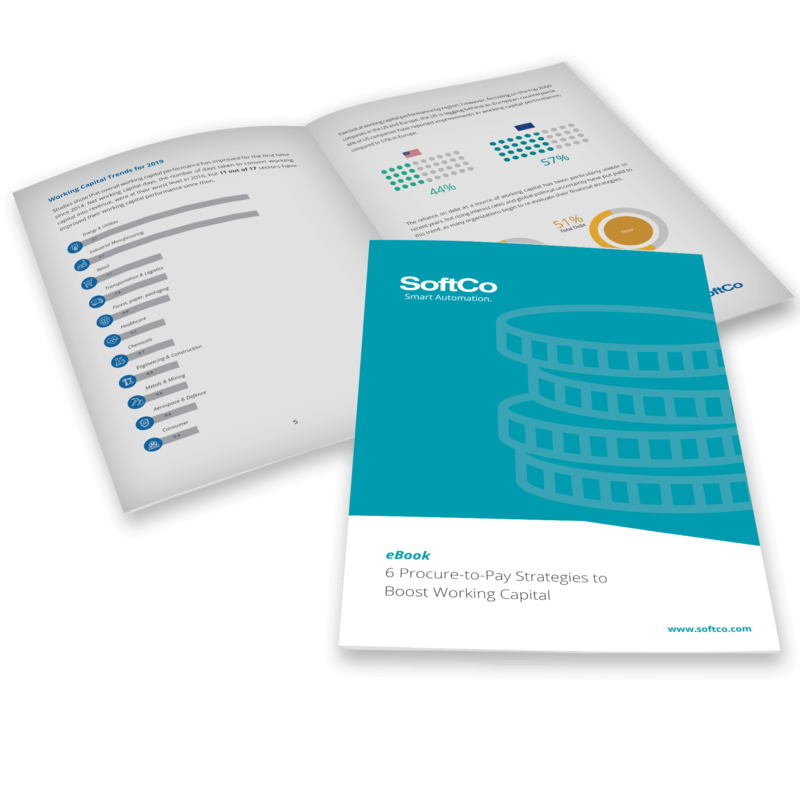 Such insights are enabling more efficient purchasing decisions and lowering costs. In their data science blog, Medium describe AI adoption in procurement as being a 3-step journey, before the true benefits can be realized. By moving away from fragmented data systems, to a single, solid foundation, organizations can then capitalize on AI for greater insights, predictive analysis and ultimately more cost savings. AI is a program that can learn and modify its behavior without external input. For example, it would be impossible for Amazon employees to review and approve each order their customers place. So Amazon implemented AI software to detect account theft and possible cases of credit card fraud. The software analyzes standard orders to establish a baseline. When someone places in order and does not behave how the software expects, it flags the account for review. Imagine you have had your Amazon account for several years and only buy books at home from your desktop computer. If someone logs into your account from a different location and buys high-end electronics, Amazon’s software will realize that something is out of place. When it comes to AI in procurement, preventing supply chain disruption is a primary goal. 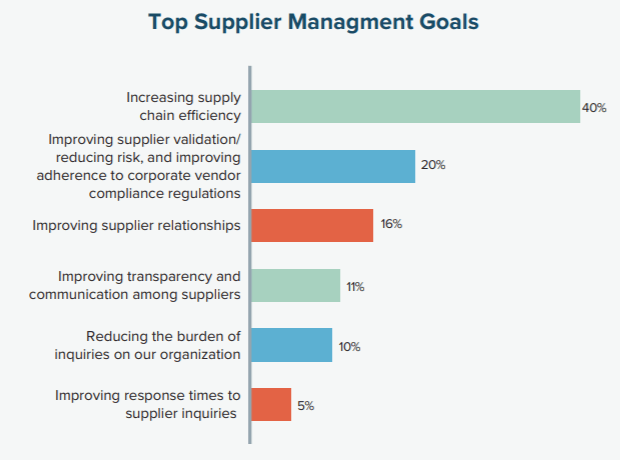 In fact, Levvel’s Supplier Management Report lists supply chain efficiency as the top supplier management goal. You count on products and other items to arrive on time, and any deviations could impact your reputation. For example, if the factory from which you buy experiences a fire, flood, earthquake, you need to know about it as soon as possible. An economic recession in the region in which your supplier is located can also have a negative impact on your supply chain. AI can detect these problems, often before they happen, and notify you right away so that you can make other arrangements. No matter your industry, complying with your contracts, internal policies and local laws is vital. Inability to comply with contracts can cause you to lose a client, but it can also land you on the wrong side of a lawsuit. 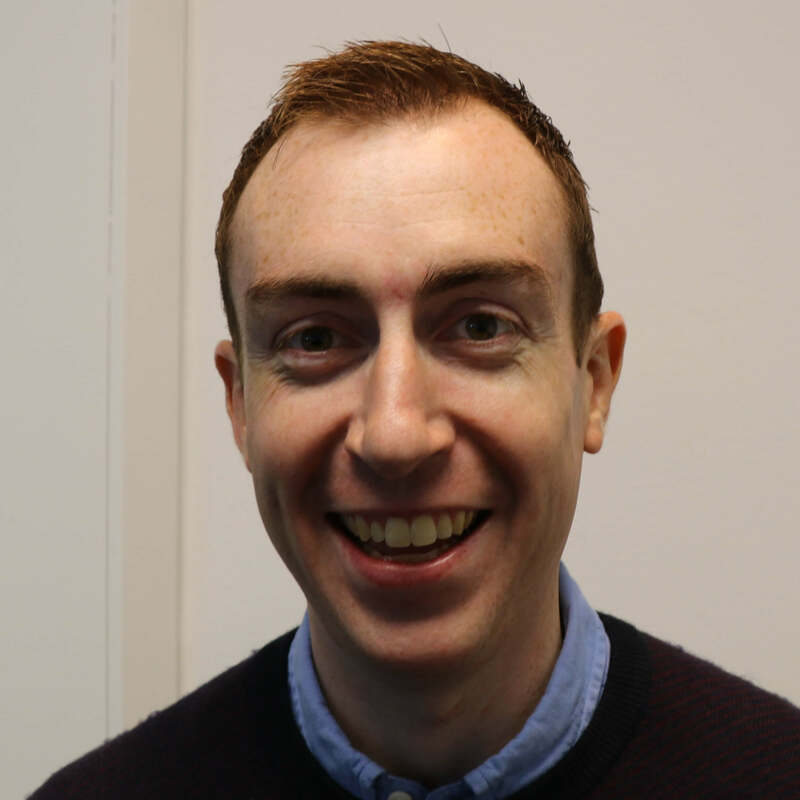 In a recent blog, we discussed how procurement teams and suppliers can work together to ensure compliance with contracts. If you don’t want to face those issues, AI in procurement holds the answer. You can use programs to ensure that you ship the right products to the right place, but AI can even help you comply with labor laws and other regulations. The ability to spot and predict future trends keeps you ahead of the competition. Doing so, however, requires you to monitor the behavior of your target customers and use the data to guess what they will buy next. All of those tasks take a lot of time and effort, but you can use AI to predict future trends without stress. You can find programs that monitor stocks, consumer trends and the latest news to predict the direction in which your market is moving. Supply chain fraud is a problem that can harm your business and profit in more ways than one. In a manual process, you may have a hard time detecting some cases of fraud, such as when a supplier bills you twice for the same order. If you place a lot of orders each month, you might not spot the threat, and the supplier can dismiss it as a mistake if you detect it. An employee creating fake invoices and keeping the money is another example of fraud. AI in procurement gives you powerful tools to keep fraud at bay and your business on track. The software tracks the orders you place and compares them to the invoices you receive. AI software that detects fraudulent purchase orders can save your business a lot of money. Besides highlighting possible fraud cases, AI software helps you track the person responsible so that you can take appropriate action. If your company is like most, you spend countless hours at the end of each month processing purchase orders (POs). You review the details and make sure you did not overspend, but you also make sure the items are in your inventory. Whether you do this task yourself or have a member of your team do it, processing POs and invoices take time that you could otherwise spend on other areas of your business. AI software can review your POs, match them to a Goods Receipt Note (DRN), and pay them automatically. You can go over the report if you want, or you can wait until the software alerts you to possible red flags. Either way, you will save a lot of time and energy when you use AI in procurement to your advantage. You take every possible step to make sure you only approve valid purchase orders. You have one team to create the purchase orders and another to approve them. While this process reduces the odds of overspending, it also increases the amount of time it takes for you to complete the purchase and receive your supplies. If you don’t want to wait longer than needed, use AI to review and approve your purchase orders. 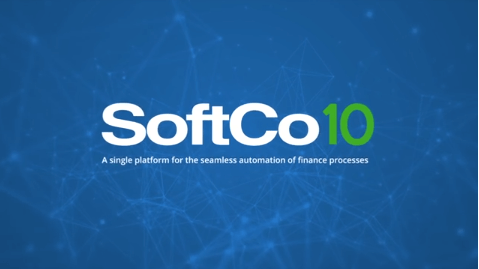 While Robotic Process Automation (RPA), looks after many of the manual, time-consuming tasks involved in invoice data capture, matching and approval routing, which we discuss in a recent eBook, AI software learns the orders you normally place, and it will flag ones that don’t make sense based on your past behavior. The future of AI in procurement has limitless potential. Whether you want to automate mundane tasks, detect fraud or keep up with the latest trends in your industry, AI lets you reach your short- and long-term goals. When you understand the benefits AI brings to the table, you won’t have trouble seeing why it’s an investment worth making.